Hello! My name is Norma Martínez-Rubin. As an independent evaluation consultant, I specialize in evaluating nonprofits’ and foundations’ disease prevention and health promotion programs and projects. I’m particularly drawn to initiatives designed to address health, economic, and educational inequities. Because of the complexity associated with such efforts, I’ve been part of multidisciplinary evaluation teams in which, after labored discussions of evaluation approaches and data-collection strategies for our evaluation proposal(s), one of us is tasked with developing a budget to accompany a proposal. I recall an early attempt where my team lead strongly believed we would increase our chances of obtaining a contract award by positioning ourselves as the lowest bidder. At the time, I didn’t voice my reluctance about that believing that team member to be well experienced in such matters. In retrospect, the low-cost approach was not the defining factor in contract selection. Nor would I want it to be now regardless of which side I occupy at an evaluation proposal reviewers’ table. What changed for me since I erroneously succumbed to the notion that low-cost evaluation services equal winning contracts, is a continual attempt to align my service offerings to prospective client needs. This requires being certain that my core services —not necessarily different from other evaluators’— are presented along with features to enhance a prospective client’s desire to seek my services. A greater perception of value is the “value added” to an ordinary services offer. 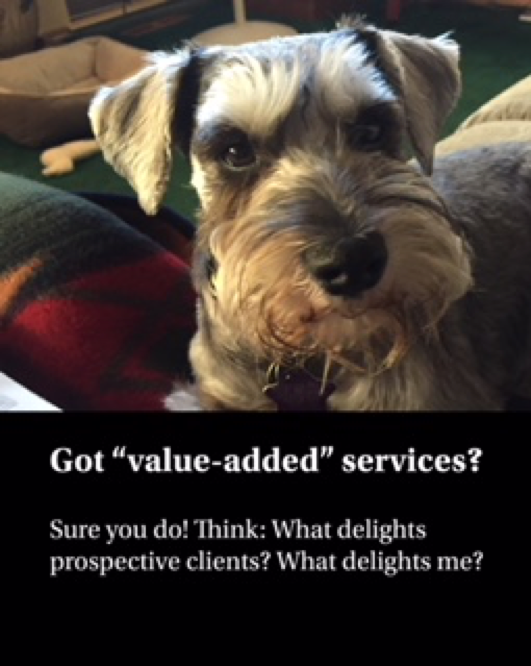 Value-added services are not cheap, low-cost menu items, but extraordinary services to support clients’ business-related reasons for entering into a contract. Among those are activities that save time, provide peace of mind, and increase efficiencies. Developing an evaluation proposal budget with this in mind ties one’s technical knowledge with business savvy. It contributes to the client-evaluator satisfaction of having a proposal that’s fair to both parties. Think of what you are willing to do if presented with certain work conditions e.g., access to decision makers, ready access to evaluation project stakeholders or data, staff availability to negotiate evaluation plans, acceptable distance to evaluation sites, reasonable number of drafts required before finalizing a data presentation. Note: These are things that, if provided, are likely to prevent or reduce scope creep. Create an outline of your core services i.e., what are the technical skills you can demonstrate and enjoy using while concurrently serving a prospective client’s evaluation needs? Quantify, in time and monetary terms, the cost of your core and value added services. Think of ways to bundle your services so when opportunities exist, you are prepared to describe them to prospective clients. Value-added services may be intangibles, too! Don’t undermine your interpersonal skills and relationship-building abilities. The American Evaluation Association is celebrating IC TIG Week with our colleagues in the Independent Consulting Topical Interest Group. The contributions all this week to aea365 come from our IC TIG members. Do you have questions, concerns, kudos, or content to extend this aea365 contribution? Please add them in the comments section for this post on the aea365 webpage so that we may enrich our community of practice. Would you like to submit an aea365 Tip? Please send a note of interest to aea365@eval.org. aea365 is sponsored by the American Evaluation Association and provides a Tip-a-Day by and for evaluators.